There’s nothing better than plonking one’s hands on the armrests and curling into the comforts of a sofa. The shopping lists are getting longer as the festive season gets nearer, and there’s reassurance knowing that there’s a dedicated space in your living room to put the feet up and unwind after a hectic shopping spree. A Loveseat is often a preferred choice. Not only is it wonderfully versatile, making the most of small and large spaces, it is usually just the right size to rest both your shopping bags and you! At Shop Factory Direct, the Paloma Traditional Pearl Beige Bonded Leather Loveseat with Gold Finish is a much-loved piece. Made of bonded leather and solid wood, with crystal tufting and hand-carved designs, the 68” (length), 40” (width), 49” (height) loveseat spells elegance. Sectional Sofas are great for big families or those who entertain guests in large numbers. There are a number of reasons why people prefer sectional sofas. Though they cost more than sofas, they offer more seating space and cost less than an entire Living Room Set of sofa set, loveseat and chair. They are versatile and can act as a room divider or make maximum use of a corner. 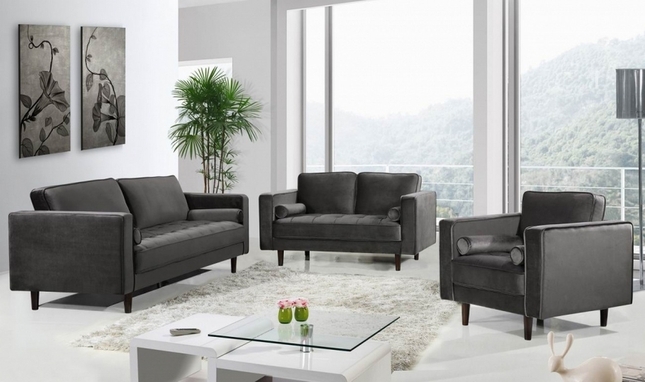 One of the best-sellers at Shop Factory Direct is the U-shaped Lawson Godiva Sectional Sofa with Chaise. Add an optional over-sized 51″ square ottoman and you can now fit a mini army! The Jana Double Chaise Deep Tufted Navy Velvet 3pc. Sectional w/Chrome Legs is another beauty. Measuring 127″L x 69.5″D x 30.5″H, the upholstery is made from velvet and simply luxurious to the touch. Glam and gorgeous, and just right for Netflix nights. A Sofa & Loveseat Set packs in the best of both worlds. One of the top-selling pieces at Shop Factory Direct is the Kensington French Provincial Beige Chenille Sofa & Loveseat Set. From the beige chenille upholstery with floral prints and nailhead trim to the button-tufted back and elegant wingback design, this one’s a winner. 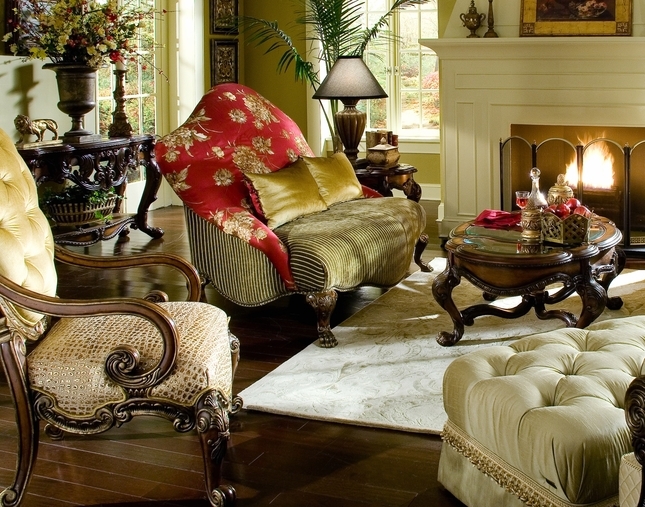 Add a happy ending to the décor story of the Living Room with a Chair and a Marble Top Coffee Table. Prefer a modern take? Macie Modern Deep Tufted Grey Velvet Sofa Set with Bolster Pillows & Wooden Legs will sprinkle a dash of contemporary sophistication to your space. Packing the family into the car, driving through nerve-wracking traffic from store to store and bargaining with salespersons is not how one desires to spend the weekends. Shop at your convenience at Shop Factory Direct, open 365 days a year and sit back and relax as single pieces to complete Living Room Furniture sets are delivered home. Fast, free shipping, usually within 3-4 business days, means that even last-minute shopping is covered. In the run-up to Thanksgiving, it’s easy to procrastinate when it comes to preparing our homes to receive guests. But you want to make sure you don’t wait until the last minute and risk not getting your order in time for your holiday festivities. Purchasing furniture online is a great way to have the best selection of furniture to choose from, as well as the lowest prices available. One thing to consider when purchasing furniture online is the location of the furniture in relation to your home and the time it will take to get to you. We have all become so accustomed to ordering small parcels online and having them dropped on our doorstep within a few days, but keep in mind that large heavy furniture has significant logistical challenges, so you need to allow enough lead time to get delivery before your guests arrive. If you’re planning a dinner party, you’ll want to start with the Dining Room, where family and friends will gather for your Thanksgiving feast. A formal dining set for a large party, with a china cabinet or a sideboard for buffet-style serving could be the trendy turn your dining room interior decor needs. There’s no better time to shop than NOW. If you’ve been watching the news, you’ve probably heard about the Trade Wars. Long story short, due to new tariffs the price of furniture is increasing very soon. Buying now will ensure that you are paying the lowest price possible for your new furniture. If you’ve been eyeing that new dining set for a few months now, do yourself a favor and purchase it right away from Shop Factory Direct, the one-stop-shop for home furniture. Shop now while the prices are stable and you’ll probably save a small fortune in the days to come. The most important piece in the Dining Room is the Dining Table. First and foremost, you’ll want to make sure the table is large enough to accommodate the Thanksgiving guests. If you are hosting a very large party, the Villa Valencia Dining Table is an 84” long table that comes with three 20” leaves which extend the table to 12’ long to accommodate up to twelve dinner guests. Shop Factory Direct has a bouquet of brands and you’ll be spoiled for choice. 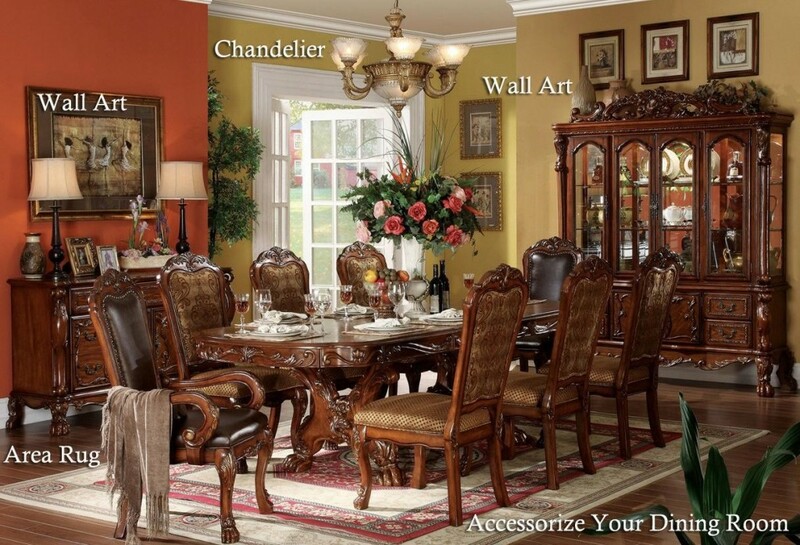 Whether you are looking for high-end luxury furniture from Michael Amini or A.R.T. 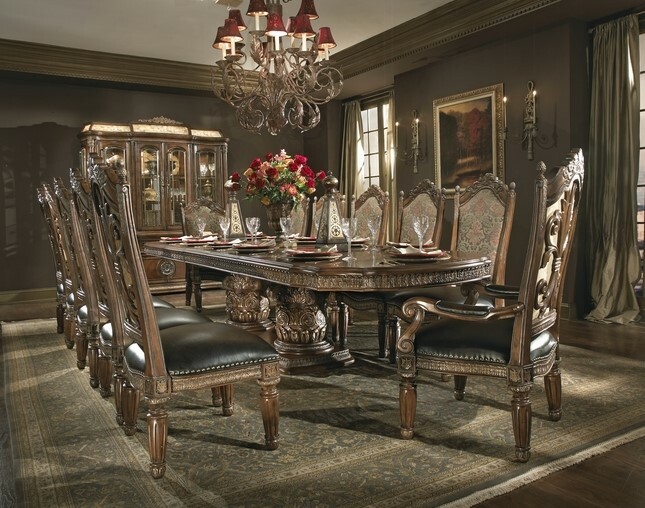 or more budget friendly options such as our best selling Neo Renaissance Formal Dining Room Collection, or the Chateau Formal Dining, ShopFactoryDirect has the furniture your home needs to create a warm and inviting environment for your friends and family to enjoy their visit. The wide variety of styles available from ShopFactoryDirect ensure that you will find the pieces that will best fit your home decor. From the timeless classic traditional designs to Hollywood glam, Mid-Century modern, contemporary and everything in between, You can find the furnishings that appear to be custom made just for you. Of course, perfection is in the details, no matter how fancy your new dining room furniture looks on its own, you want to make sure to accessorize the room. 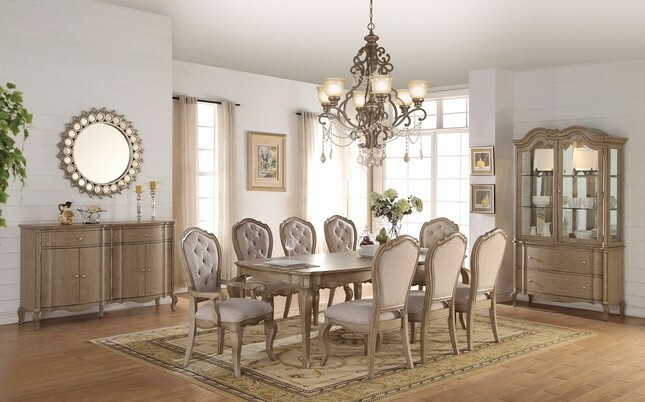 As you are browsing through the large selection of dining room collections, you’ll notice that they are all photographed in a room that has been “staged” meaning an interior designer selected decor accessories to coordinate with the furniture. For example, If your formal dining room floor is wood or tile, you want to make sure to select a nice Area Rug to put under your dining room furniture. Decorative Wall Art is another essential part of the equation. Finally, you’ll want a nice chandelier to hang above your new table so your guests can see the spectacular feast you’ve prepared for them. After all, you want guests to have the perfect view of the delicious spread of Roast Turkey, Sweet Potato and Pumpkin Pie! There are plenty more fab furniture pieces from that can lend charm and class to your Thanksgiving dinner. Now all you need is to get some great conversations going. Don’t forget to have each guest to say what they’re thankful for. The first space that guests get a glimpse of inside the house is the Living Room. And with the festive season knocking at the door, it won’t be long before family and friends come visiting! The Living Room is also where the family congregates, whether it’s watching TV, updating each other on the day’s proceedings, or simply lounging on the sofa. Being one of the most versatile spaces at home, decorating this space can be a challenge. Look no further – Shop Factory Direct is your go-to online hub for home furniture and home furnishings available at factory prices. Sofa Sets, Living Room Sectionals, Love Seats and Settees, Futons and Sleeper Sofas, Chairs, Chaise Lounge Chairs, Reclining Chairs, Ottomans, Benches, TV Stands, Entertainment Centers, Tables, Storage Chests, Bookcases, Fireplaces, Accent Pillows… the list of products and bouquet of brands that Shop Factory Direct offers is enviable. Sofas & Sofa Sets: Pick from casual models from brands like Simmons to priceless items like the Michael Amini Chateau Beauvais Luxury Chair Set. Love Seats & Settees: The Tuscano Biscotti Loveseat to the Michael Amini Mia Bella… give this place of pride in your living room. TV Stands & Entertainment Centers: From an Alastair Vintage TV Stand in Brown Top Grain Leather to Parker House Entertainment Units, make the e-zone a comfy zone. Ottomans: These light-weight and easily movable seats often double as coffee tables and foot rests. Pick from high-end traditional Mid-Century European-Inspired Ottomans to trendy Leopard Print Storage Ottomans. Chairs: Alongside the sofa, couch and love seat, find space for a relaxing Brahms Power Glider Rocker Recliner, a traditional Versailles Button Tufted Vintage Faux Leather Chaise or a contemporary Jace Plush Beige Velvet Accent Chair. Here’s a tip! Furniture creates a focal point. So, pick one piece and create your design around it to lend your decor a narrative.